For my boyfriend's birthday this year, I bought us $125 BuyWithMe coupons for tandem skydiving in New Jersey. I was pretty pleased with myself at scoring the package on the cheap. 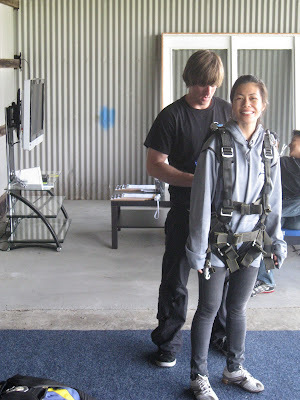 Until I told my friends, most of whom laughed at me since they couldn't quite believe I would entrust a death-defying experience to a company that would promote on a discount site! I had done my due research and the company seemed like a pretty solid one, but decided to do another background check after witnessing my friends' laughing disbelief. And that's when I realized that I was reading reviews on the wrong company, and the one that I actually bought tickets for seemed like a newbie as they barely had any reviews! Yikes! Suiting up for the big jump. We were made to watch this "informational" video that basically told us that if we die or get injured (even if it was due to company negligence), we could not sue the company. The guy on cam had this fantastic table-grazing beard, and our theory is, the beard is there to distract us, and make us forget we could actually die. Up in the air. Boy, we were cramped in this plane. Halos mag-tandayan na kami! The other guy is Pat's tandem partner. The view from 10,000 feet, the point where panic starts to slowly creep in. AAAAGGGGGHHHH!!! The free fall is the scariest part—like 10 crazy roller coaster/octopus rides all together. Of course, the pull of gravity on your face is quite scary too (the horror of wrinkles!). Anyway, we were still pretty excited, so we decided to make a road trip out of it when it was finally time to claim our purchase. New Jersey's reputation has suffered adversely from the popularity of the trashy MTV show "Jersey Shore," but I was happy to discover that there is a whole other quaint side to this state that was begging to be explored. 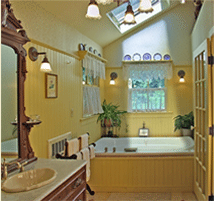 We decided to stay at a charming bed and breakfast called Widow McCrea in Frenchtown, which is near New Hope, Pennsylvania, and Lambertville, New Jersey—areas which are known for their delightful shops and charming communities. I was able to do a bit of thrift and vintage shopping during our trip, so I'm sharing a selection of my photos with all of you. We stayed at the Anne-James Suite, which was decorated with antiques and Victorian-style knick-knacks. Photo courtesy of Widow McCrea. 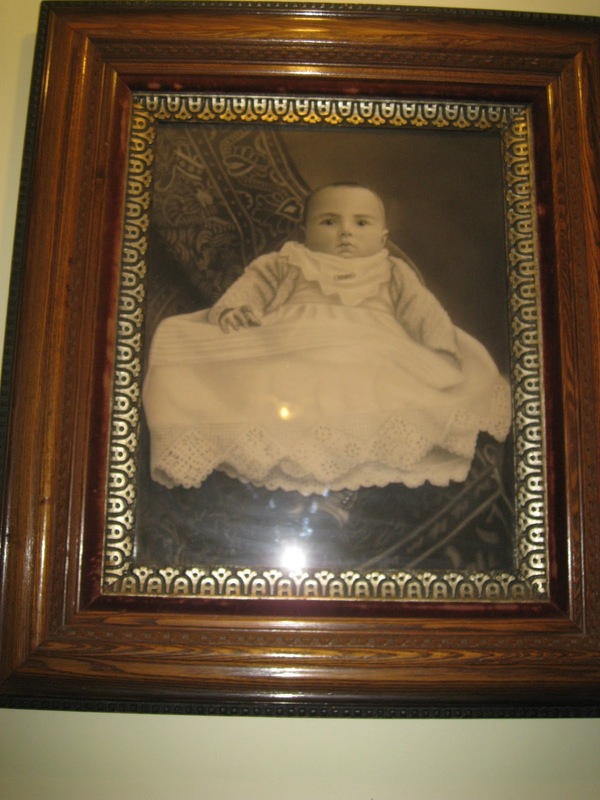 I could have done without the creepy portraits scattered throughout the room. Afraid! 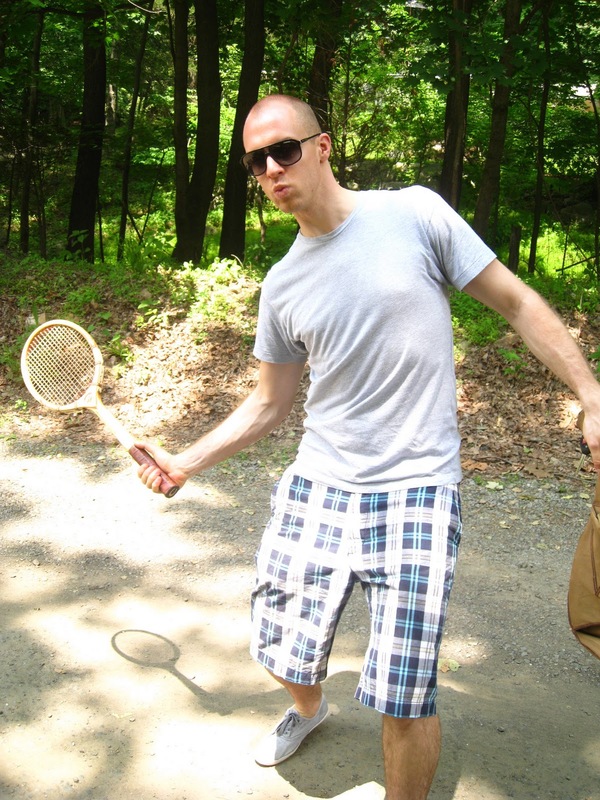 If you're lucky, your fellow b&b guests will be warm, interesting people. You're even luckier if your hosts are fantabulous cooks (Ours was. Just look at the delicious breakfast plate below). However, they lost points when they decided not to serve us breakfast the one morning we got up a bit late. Perpetually hungry me was miffed after that. If you decide to go to this area, you must visit the Golden Nugget Flea Market. It's open year round, Wednesday, Saturday, and Sunday from 6 a.m. to 4 p.m. According to their website, it is "a 40-year-old Lambertville institution...Started in 1967, the Golden Nugget is a 'gold mine' of an indoor/outdoor market specializing in antiques, collectibles, art and more. This is not your everyday flea market. We are the East Coast's premier market for vintage and retro items such as furniture & home decor, paintings, clothing, jewelry, Victorian collectibles, sports memorabilia, model trains, books, dolls, arts & crafts, toys & games, lamps, pottery, comic books, vinyl albums, clocks, watches, glass, china, porcelain, garden items, coins, stamps, art deco, hardware and everything else imaginable that is antique or collectible." Whew, what a list! But they were right, I've never seen so many interesting/cool/kooky/fashionable things in one area. It's easy to spend hundreds of dollars in this place. Vintage typewriters. I'm unearthing our old elementary school-era clacker so I can use it as home decor! Why anyone would want to buy creepy hairless doll faces is beyond me. I would, however, buy these hilarious illustrations of fruit and vegetable citizens. I lust for these rose gold ceiling lamps. The $1 box where I scored a black and white vintage pin, and a slim Casio-esque gold digital watch for my friend. I bought belts from this stall for $5 each! I was happy to score the gold scale belt. I had a similar one before but the scales fell off. I also bought a black beaded belt that I can't find. Even the boyfriend managed to find a vintage tennis rack for a bachelor party he was organizing. They were supposed to watch Wimbledon dressed as '70s tennis players, haha! 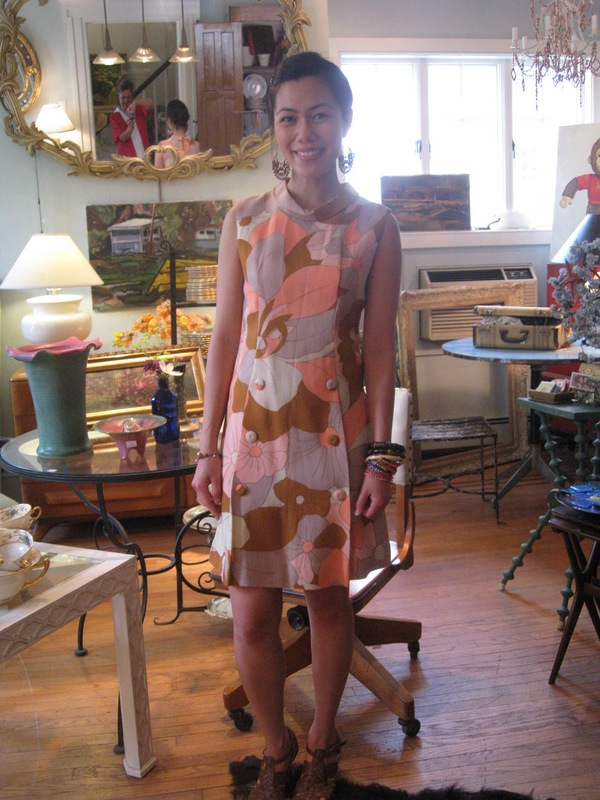 I did some vintage shopping as well in the town of Lambertville. My boyfriend and I was just passing through in our car when I spotted a store that had a rack of clothes outside. After spending a couple of hours at the flea market, I was hesitant to ask my boyfriend to stop (he gets grumpy after too much shopping), but he must have seen the longing look in my eye because he decided to park so I could go have a peek. What a sweet man I have! Good thing my eagle eye spotted Palette Vintage. Anything on a sale rack always catches my eye! I scored this peachy printed shift for $20, more or less. And this printed frock for the same price. I almost didn't buy this, but the ladies at Palette convinced me to get it. I'm happy they did! It has become one of my favorite pieces. 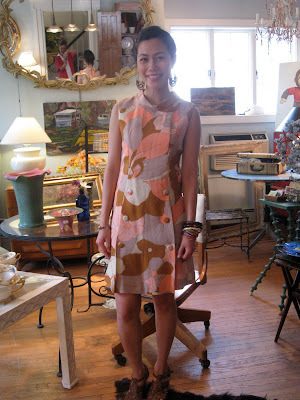 Funny how I wore a mix of thrift and vintage finds to a thrift/vintage shopping expedition. 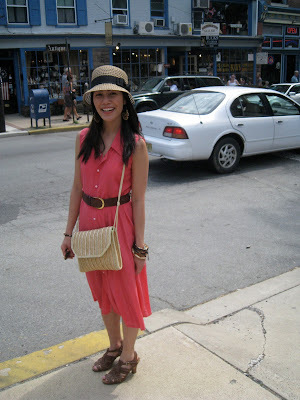 Hat, Strawberry; dress, St. Luke's Thrift Shop on Hudson Street, NY; belt, Baguio ukay find; bag, bought at FIT Thursday open market; shoes, Aerosoles; earrings, Funk Your Junk (Ottawa, Canada); bracelets, from H&M, muses and lovers, and bamboo bangles I bought in Florida. There are also a lot of vintage stores in New Hope. I didn't get to see all of them, but the one store that I did love was Cryer's. Cryer's sells a lot of collectibles and antiques. But they are best known for their high end and remnant fabrics. I would love to have cushions upholstered in this fabric! And of course, there were noteworthy shops in Frenchtown (where we stayed) as well. We explored the area on the day we were headed back for New York, so we really didn't have much time to walk around. 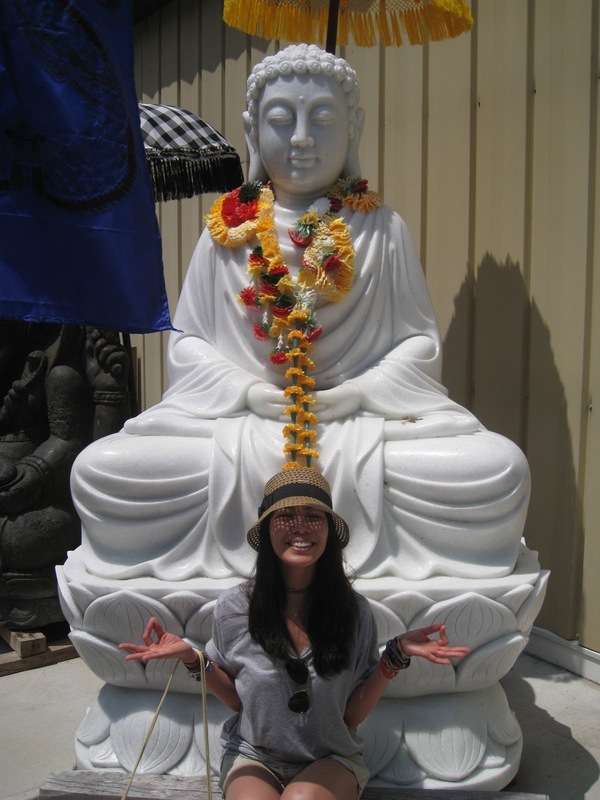 The most famous shop would have to be Two Buttons, "Eat, Pray, Love" author Elizabeth Gilbert's rambling warehouse of Southeast Asian "unnecessities" ranging from gigantic statues and wood-carved wall hangings, to semi-precious bead jewelry and silk scarves. It's really not a shop. I would imagine this is what a smuggler's den would look like, haha! I'm wondering how she managed to get all those monster stone statues into the country. I wish I could have these glass lamps hanging in our garden. "Eat, Pray, Love" translated in God knows how many foreign languages. Free to take home. My super favorite store of this trip though is Modern Love. Occupying a bright, spacious spot on Race Street, Modern Love peddles the cutest stationary and knick knacks, as well as a fine selection of art and graphic books and magazines. They also sell accessories and clothing. I could have browsed this shop for hours! Isn't it the cutest store? Photo courtesy of Modern Love. I told you typewriters make good decor accents! Photo courtesy of Modern Love. I got a Yoshitomo Nara postcard book. 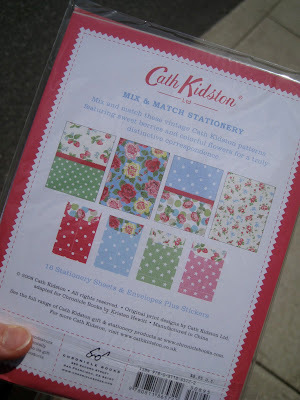 And these pretty Cath Kidston mix and match stationary set. Powerbooks actually has these as well. Of course, no trip would be complete without the requisite food tripping. We visited Bobolink Dairy Farms in Milford, NJ, where the owners, Nina and Jonathan White practice sustainable and humane farming. This means cows are grass fed and milked seasonally. New Yorkers, Bobolink sells at Farmer's Markets. Check their schedule here. I still have dreams about this smoked duck breast. One of the most delicious things I've ever tasted! Their artisanal cheeses are made from raw milk, cave-ripened, and aged 60 days or longer. Their rustic breads are baked in a wood-fired over. We bought a special one the day we went, I think it was a focaccia baked with herbs and duck fat. With the cheese, it was superb! At the Station Pub in Lambertville Station Inn, our server made us a fruity prosecco drink that was not on the menu. The fruits soak up the bubbly so at the end of your drink, you have these delicious sinkers to look forward to (I know my boyfriend did!). Birthday dinner was celebrated at the Milford Oyster House. Of course the best oysters were the ones that came from Canada! MOH is quite renowned as a seafood resto. No contest here. My Crab Norfolk (jumbo lump crab sauteed with lemon and black pepper) was simple yet mmm mmm good! I always make it a point to visit ice cream parlors in small towns. This is Gerenser's Exotic Ice Cream on 22 Main Street, New Hope, PA. I like my ice cream chunky and creamy and the ones in these parlors almost always are. Before heading home, we stopped by Clinton, NJ for lunch. Clinton is famous for its Red Mill, which I must say is quite picturesque. I forget where we ate but it was an Italian restaurant with a great view of the Red Mill. Food was ok, nothing spectacular but still good. I just don't like it when restos serve a dish swimming in sauce. Kamusta naman ang Proactiv vending machine! Yes, we did survive the jump so thank you Skydive Jersey for getting us back to ground in one piece! And yes, I would definitely repeat the experience, especially since the second camera was broken, so I don't have photos of me in midair, poopie. I officially totally love your writing style. Garage sales! We used to make that a weekly habit when we lived in the US. Can't wait to catch up with you this Thursday! Thanks for "finding" my blog! Hahaha I am really the worst updater ever, but yours is so nice and entertaining! I love this entry! Anyway, will keep in touch!! And will subscribe! :) haha! Sounds like an amazing trip! The dresses you scored look great. I love flea markets too. I try not to visit them too often because I know I'll just blow too much money! Andrea! Yes, just painted our townhouse today, nakakatuwa! But we're only renting that's why we can't do much so any tips in the home department are always welcome! 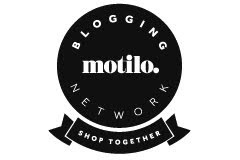 Share with me naman your favorite stores in the metro plus inspi home blogs. i want to make our place nice even if we can't do much! 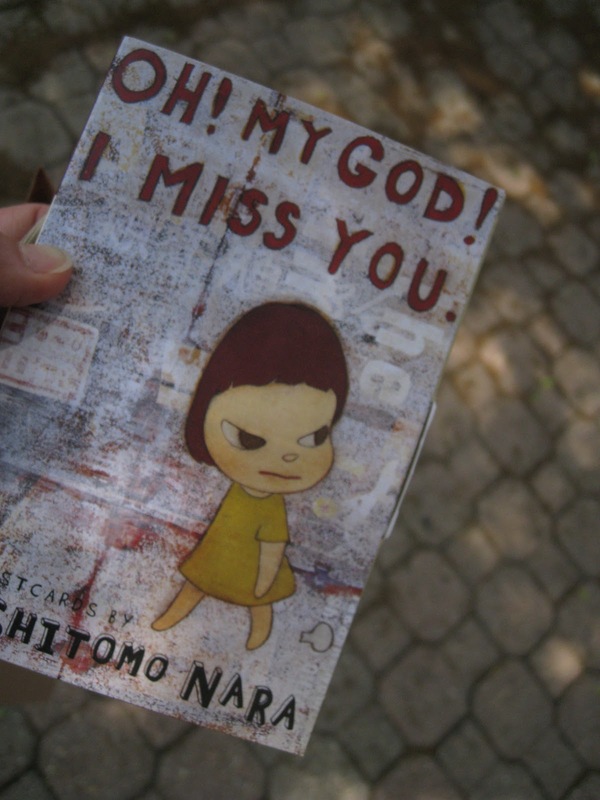 Or maybe I should read your blog nalang haha! Deepa, yes it was nice! Road trips are always fun, especially when you have a very game partner/companion. I know what you mean about flea markets. I always think I save money but I end up spending more precisely because of that "it's cheap anyway" mentality haha! What are your favorite fleas?